Man City forward Sergio Aguero hit a perfect hat-trick this evening as Pep Guardiola’s side 3-1 at the Etihad to keep their lead at the top of the Premier League to 12 points. The Argentine international bagged his first in the 34th minute, after a cross from Kevin De Bruyne was flicked in by the 29-year-old to give the home side the lead. The Citizens, and Aguero, then doubled their tally in the 63rd minute, after the former Atletico Madrid forward converted a penalty that was won by England international Raheem Sterling. 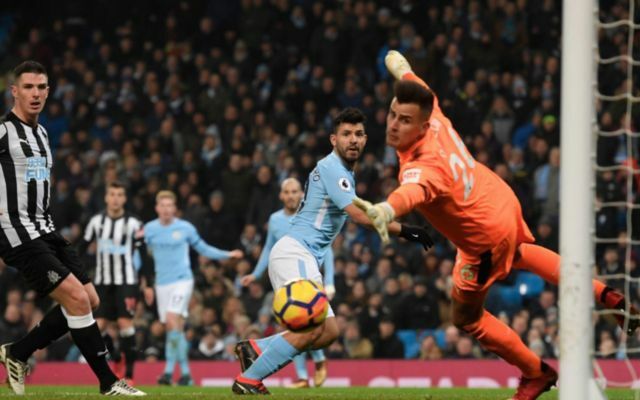 Newcastle then pulled a goal back through Jacob Murphy, who chipped his shot over Ederson in the 67th minute to give the Magpies a way back into the match. Aguero then wrapped up the scoring, and his treble, in the 83rd minute, after a fantastic run from Leroy Sane allowed Aguero to fire him with his left foot to give City a 3-1 win. The win meant that the Citizens keep their lead over rivals Man United to 12 points. Sergio Aguero is the only candidate for this award this evening, as the forward’s hat-trick effectively gave his side the win over the Magpies. Aguero’s positioning and lethal finishing proved to be the difference today, as the Argentina international took his tally for the season in the Premier League to 16 goals. Aguero sure does love playing against the Magpies! The first PL perfect hat-trick since when? Btw, Sergio Aguero is unreal. Form is temporary, class is permanent.? Loool so the ‘declining’ Sergio Aguero gets another hattrick. Man is simply class! ..what a world class striker aguero is ..35 mill seems like an absolute bargain these days. Sergio Aguero is the Wayne Rooney of Manchester City. He's been at this top level for the past few years. World class player. ?